Triangle Collision is a high quality Lexus body shop that delivers expert and convenient Lexus repairs to the Morrisville & Cary, NC area. Our technicians have the training, tools and equipment to ensure that your Lexus is repaired to pre-accident condition. Our shop is equipped to handle your vehicle from body repairs to refinishing after an accident. If you live in the Morrisville or Cary area and have a vehicle that was involved in an accident, contact Triangle Collision at (919) 460-7693 or fill out our form! We understand that your Lexus is a significant investment, and are confident that you will be satisfied with the quality of our service. We offer Lifetime Warranties for our repairs and paint services. This way you can rest assured that your vehicle will be repaired to pre-accident condition. .
We build long lasting relationships with our customers. It is important to have a Lexus repair shop that you can trust in the event of the unexpected. Other shops might cut corners, but not Triangle Collision. We dutifully follow factory guidelines when repairing your vehicle. Lexus parts are designed very specifically to deliver the performance and safety that you have come to expect. By repairing your vehicle the right way, and with OEM parts, you can feel confident that we can return your Lexus to how it was before the collision. It’s your choice, not the insurance companies, where your vehicle is repaired. Choose Triangle Collision, the Cary, NC area’s premiere Lexus Body Shop & Collision Center. Lexus constructs their vehicles to meet the high standards of performance, comfort and safety that their customers have come to expect. We approach your vehicles repairs with the same dedication to quality. We strictly follow factory guidelines for Lexus repair which allows us to deliver an “invisible” repair for your vehicle. This means that under expert inspection there will be no signs that your vehicle was in a collision. It’s not an illusion. By following factory techniques and using high quality parts we will be able to return your Lexus to the exact or even better condition than before the collision. The safety and performance of your Lexus is paramount, but you still want it looking good, too. Our facilities are equipped to handle all of your paint and refinishing needs onsite. We use BASF technologies, the industry standard for paint and refinishing services. We will be able to perfectly match the original color of your Lexus. At Triangle Collision we will handle your repair needs from start to finish, so that your Lexus will look and feel just as it did when you bought it. Let us take the stress of dealing with the insurance company off of your hands. We understand the claims process and will work with the insurance company to get your Lexus back to pre-accident condition. 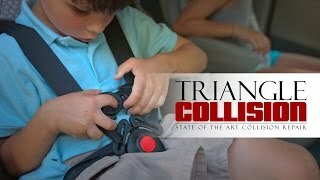 At Triangle Collision we never cut corners. Lexus has invested millions into developing advanced safety features for their vehicles. Structural components and sensors have been designed to react in a very specific way during a collision. This is why it is so important to follow factory guidelines when repairing a Lexus. Improper repairs can disrupt the functions of these features and leave you and your family at risk in the event of another collision. We get it right the first time because the safety of our customers is our top priority. .